File associations are written to the Windows Registry by default. This usually happens during the installation of the operating system and computer software programs. Installing Microsoft Word will make it the default word processor on the computer system with file types like docx or doc opened by it by default. The same is true for many other applications like software music players, video players and basically any other tool that can open files automatically. Only portable applications are problematic. A portable software is by default one that can be run from a folder without installation. It works out of the box and will not write data to the Windows Registry. But without changing the file associations it means that the user has to use the Open With dialog or drag and drop to open files on the computer system with a portable application. The creation of PEM, Pure Enigmatic Magic, changes this. It has been created to fill the gap. 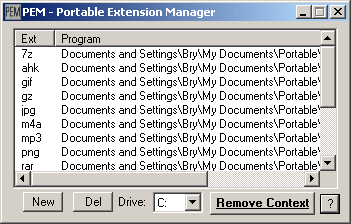 The software program acts as a proxy that can be configured to associated certain file extensions with programs on the computer system. It could for example be configured to direct requests to open mp3 with AIMP2 instead of the default iTunes or Windows Media Player. PEM is a tiny portable software program that runs quietly in the system tray upon execution. It uses about 400 Kilobytes of computer memory while doing so and will direct all requests to open the configured file types to applications that have been added by the user. The user needs to type in a file extension and a relative path to an application that should open that file extension. PEM will then ensure that the file type will be opened by the program configured in its options instead of the default program that has been associated with the file type in the Windows Registry. The software program is very helpful for users who work with portable software and makes a perfect fit for any USB software collection. When I attempt to use, AVG anti-virus warns me about a trojan. Vey nice one. I know some portable intercepts association itself (Opera@USB for example) but it is still somewhat rare. Thanks for find! Bookmarked to try.